Simple, smart contemporary style - the optimal choice for easy cleaning and secure ventilation. 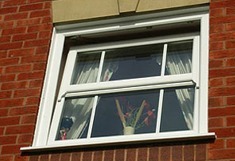 Opening at the top or the side, our Tilt 'n' Turn window is simple to clean and always secure. Our tilt 'n' turn windows are made from strong and durable uPVC, virtually maintenance free and their simple style is particularly suited to contemporary homes. Like all James and Co. (Midlands) Ltd.'s windows our Tilt 'n' Turn windows are smart, warm, quiet, secure and highly practical. They are tailor-made to suit your home, and manufactured to exacting standards. What's more, our uPVC tilt 'n' turn windows require virtually no maintenance - the tough, resilient surfaces simply wipe clean with a cloth. Designed to virtually any height or width you require, you'll find that our high quality tilt 'n' turn windows will enhance your home in an attractive and practical way for years to come. See how James and Co. (Midlands) Ltd. gives you peace of mind that can come with the unrestricted means of escape in an emergency or for ease of cleaning the outer side of the window.